As the US continues to struggle with how the healthcare system needs to be reformed, it was interesting to spend a week focused on Sweden in my Global Communications class this week as it presents an interesting opposite. The country has a high degree of nationalized services, which citizens of Sweden pay handsomely for with a tax rate that hovers between 50% and 70% – but for this amount everything from healthcare to long maternity leaves are covered. Coupled with a relatively isolated location in relation to Europe, beautiful geography and a national obsession with the environment, it is no surprise that the country routinely ranks at the top of the list for global quality of life surveys. Online, the country has made big news recently for being the unauthorized home of illegal file downloads through a site called Pirate Bay. The site has been in legal trouble of late, being found guilty in Swedish courts of copyright infringement. The debate continues in the country, regardless, where there is even a political party dedicated to furthering the ideology of the site in terms of open copyright free access to content. Social media is not about ego. It is easy to get the sense by looking at the rise of social media in the US and many other countries that it is all about ego. People publishing content in order to get their moments of “internet fame” and focused on getting others to link to their content or retweet their best sayings. In Sweden, most reports point to the central emotion in the culture being more reserved and less about promoting the self. This manifests itself through social media in subtle ways, from limiting the active use of review and ratings sites to reducing the number of individual Swedes who create a large profile and personal brand for themselves through social media. Language is not much of a barrier. The language of choice for many Swedish resources was English, and in those cases where there were Swedish language sites, the translations were usually one click away and quite strong. The other implication of this is that unlike some other cultures, global sites such as Facebook also have a strong and growing local appeal here. The country of Sweden is well branded online. 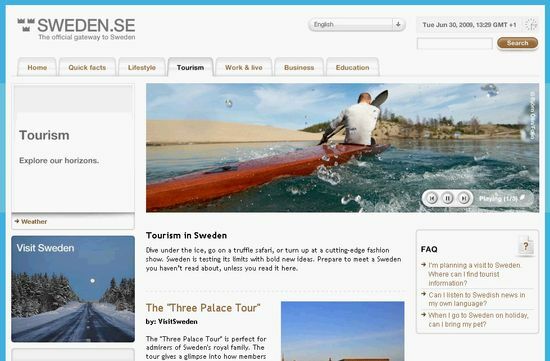 The first thing you are likely to find when researching Sweden online is the extremely useful official government portal site – www.sweden.se. The site features everything you would ever want to know about the country, includes frequently updated content from blogs and social media, has a easy to use interface and presents what may be one of the strongest country branded official portals any nation has put online. Environmental friendliness is a way of life. Everywhere you turn, you can see evidence of Sweden’s progressive attitudes toward the environment. Their Environmental Protection Agency (EPA) has released 16 ambitious objectives that are meant to guide the country toward a sustainable environment within one generation. Fashion is a hot topic in social media. There are several blogs devoted to covering fashion in Sweden, driven by a few big events such as Fashion Week in Stockholm in late January and early February. Children are protected from marketers. Sweden has a reputation as one of the most aggressive countries when it comes to banning advertising to children under the age of 12. TV ads during prime time are banned to this age group and the country has been active in encouraging other European countries to follow their example. This first gained attention in 2001 when Sweden had ascended to the European Union Presidency for their 6 month rotating term. They are due to begin their next term on July 1st of this year, just a few days from now … so this may come up again as a core issue. Texting is for amateurs. The sophistication of how many Swedes are using their mobile phones is vastly beyond what many in the US may consider active mobile phone usage. Texting is only one small element of what you can do with a mobile phone in Sweden. More interesting is that you can pay for your groceries, submit your taxes and stream broadband content effortlessly – without losing a signal. Research, innovation, technology and creativity drive the economy. The country has a long history of research and innovation, including a status as the #1 biotech industry in Europe per capita and a focus on mobile technology and design innovation. This combination recently propelled the country onto the Entrepreneur magazine list of top 5 “Global Tech Hot Spots” along with Singapore, Norway, Finland, Denmark and Switzerland. Anyone else spot a pattern?